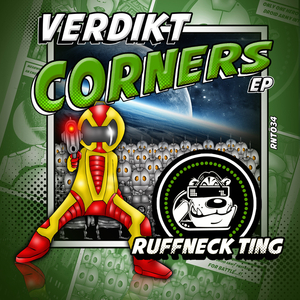 Rising UK junglist Verdikt gets lively with Bristol skank bastions Ruffneck Ting. With a dubwise vibe rolling throughout, it's another ageless document: "Chalice Pipe" warns of naughty narcotic combos while horns pierce the darkness with balance and funk, "On The Corner" is all about the subs and snares that punctuate in a fashion similar to Digital or, more recently, Stealth. "Cornerstone" is a classic jump-up flavour a la DJ Stretch while "Money First" jitters with a strange sample, humming subs and an array of classic zap FX. The verdict? Guilty... Of pure gulliness.